This water based stain by Surecrete is an exciting alternative to typical reactive acid staining. There are no acids or harmful chemicals integrated in its design. Since no chemical reaction takes place, there is no extended waiting time for color to reach full development. Cement substitutes will not affect color, unlike reactive acid stains that are dependent upon alkalinity to create a chemical reaction. Does not require messy, chemical neutralization process prior to sealing! Apply first coat of Eco-Stain with SP sprayer on dry surface using caution to avoid track lines from the spray pattern. A circular motion with the wand is desired. 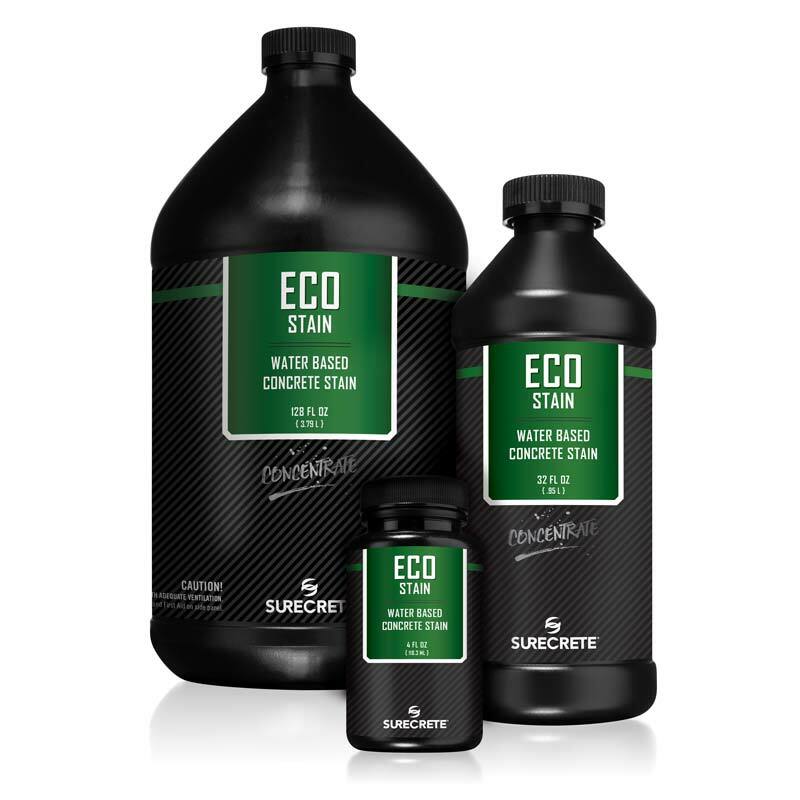 Eco-Stain may be applied full strength or diluted with water to the desired rate. Applying additional coats of Eco-Stian is optional. Supplementary colors may be combined at desired rates and number of coats. Customarily apply lighter colors first. In addition to spraying, some contractors employ mopping, sponging, and ragging, especially for accenting. CLEAN-UP— None, simply allow drying. HOW LONG DO I HAVE TO WAIT BEFORE SEALING THIS COLOR? project. The more stain you use in a given area, the longer it will take to dry. CAN YOU MAKE ECO-STAIN LOOK LIKE ACID STAIN? WHY DOES MY STAIN FADE OVER TIME? replaced or “replenished” with a fresh coating. HOW FAR CAN IT BE DILUTED? lose some of its properties as is spread too thin across a surface.